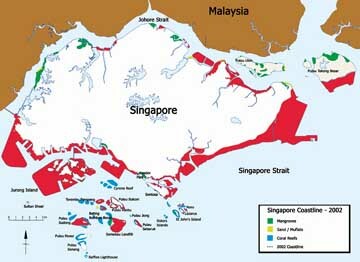 Land reclamation which increased Singapore's land area by 17% has buried much of Singapore's coasts. Most of our natural sandy shores have been lost to reclamation. Construction of reservoirs by damming rivers and draining wetlands have also badly affected the habitats near river mouths and on intertidal shores. These have reduced coastal ecosystems drastically. Mangrove forest cover has been reduced from an estimated 13% in the 1820's to only 0.5% of the total land area. 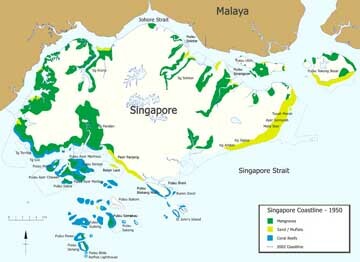 Many of the original 60 offshore islands and patch reefs around Singapore have been reclaimed. Some were merged into larger islands. Since 1986, most coral reefs in Singapore have lost up to 65% of their live coral cover. more about the shores lost in this plan. The massive changes to our shoreline means than many of our coastal areas are no longer complete ecosystems. The original habitats are fragmented and separated from one another. Animals at the top of the food chain have long since disappeared affecting the balance in the remaining habitats. For example, we no longer have tigers in our mangroves. And animals such as crocodiles are no longer common. Dugongs, dolpins and sea turtles are also less commonly seen. 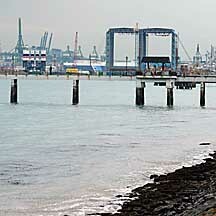 High levels of coastal activity (shipping, dredging and continued reclamation and coastal construction) also contributes to sedimentation, or murky waters. While visibility underwater in the 1960s was 10m, nowadays, this has been reduced to 2m or less. Sediment in the water reduces the light penetration into the water. This affects photosynthesis by seagrasses and other plants, as well as corals which rely on their symbiotic algae for products of photosynthesis. But this does NOT mean that all our shores are dead. The remaining shores are still very much alive. It is not yet too late to protect and preserve them. From Hugh Tan et. al., "Conservation of marine habitats still lags behind somewhat compared to the efforts on land, although this is not from want of trying. We have yet to establish a Marine Protected Area despite many attempts to do so. The main reason is that the southern shores, where most of the best reefs are located, are also the hub of our important shipping activities and our growing port facilities, Singapore being the world's busiest port." Major shipping lanes near our shores. 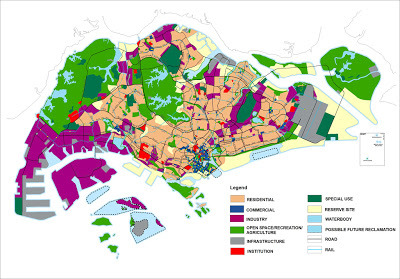 What shores will Singapore lose in 7 million population plan? on the wild shores of singapore blog. 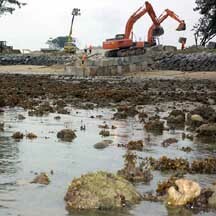 Latest coastal works on our shores on the wild shores of singapore blog. History and Biodiversity of Singapore's Mangroves Ng, Peter K. L. & N. Sivasothi, 1999. A Guide to the Mangroves of Singapore. Singapore Science Centre. 168 pp. Coral Reefs of Singapore by the Marine Biology Lab, NUS. A comprehensive site with lots of photos and maps, tons of info on all our southern islands, and all about reef conservation efforts in Singapore. Singapore Waters: Unveiling our Seas a book by the Marine Conservation Group of the Nature Society (Singapore) with photos and maps of coastal changes. 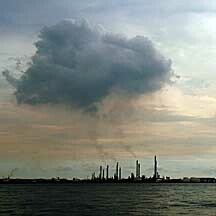 Land reclamation in Singapore on thinkquest. Bedok land reclamation by Marsita Omar on the Singapore Infopedia of the National Library. 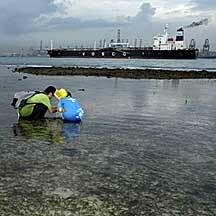 Encyclopedia of Coastal Science by Maurice L. Schwartz, has excerpts on Singapore reclamation, on google book search. Erosion on Singapore's shores on the wild shores of singapore blog. 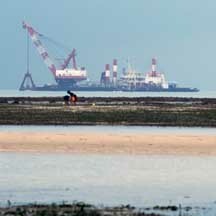 Faster, cheaper land reclamation in Singapore on the wild shores of singapore blog. 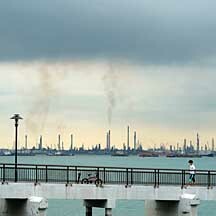 Is more reclamation on Singapore possible? on the wild shores of singapore blog. Singapore-Delft Water Alliance: help for our reefs, seagrasses and mangroves? on the wild shores of singapore blog. Tan, Hugh T.W. L.M. Chou, Darren C. J. Yeo and Peter K.L. Ng. 2007. The Natural Heritage of Singapore. Second edition. Prentice Hall. 271 pp.